In Japan, a multiple-megabit Internet connection costs pennies. I pay $99 for 50-mbps (and that’s really about 1 mbps (when it’s not raining) in Brooklyn. But why, you ask? Well, to hear cable companies (and carriers) tell it, it costs a pretty penny to get all that data to your door. Providers have to lease connectivity from the backbone and, as such, they’re forced to add caps to prevent us users from sucking down too much data and bankrupting them. But Mr. Cringeley, in an excellent examination of the real bandwidth costs in America, proves them wrong. First, take a look at this. This is coming from a house organ for ISPs, so take it with a grain of salt. 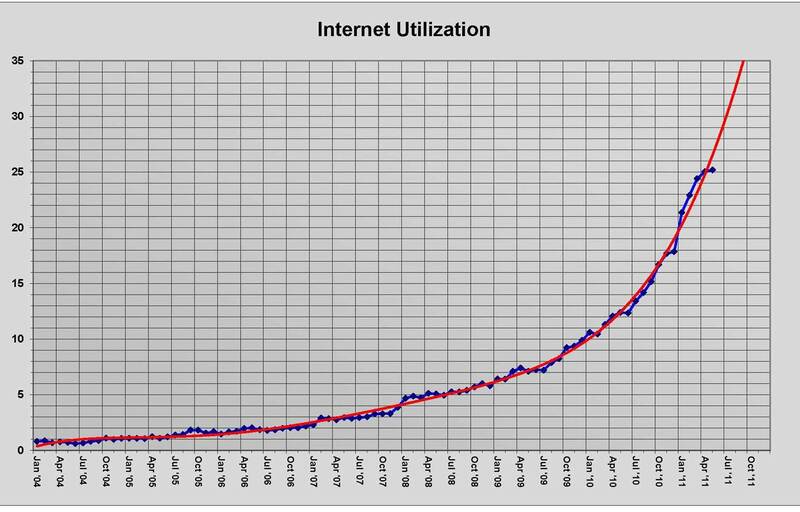 This shows bandwidth usage skyrocketing. But there is a real cost for boosting capacity to meet nonstop video streaming. Netflix argues that the cost to deliver an incremental Gigabyte is “less than one cent, and falling.” In aggregate, however, it’s a different equation. Growing network capacity from 100 Gbps to 1 Terabit per second isn’t just a couple of pennies. Basically, ISPs claim our data usage is going up and they must react. In reality, their costs are falling and this is a dodge, an effort to get us to pay more for services that were overpriced from day one. Basically, they’re quietly raising our rates while pretending to prevent a tragedy of the commons. It all comes down to provisioning. Right now providers charge us for unlimited connectivity while they are actually provisioning a much smaller line. The assumption is that you will use far less than you claim and they can therefore buy a smaller amount of bandwidth per user and assume that, on average, you will never surpass that amount. Google did this a few years ago when they opened data centers across the country. Instead of transmitting terabytes of information over a long period, they knew the ISP would charge them for their 95% usage rate. Therefore, they transmitted like mad for one night – terabytes of data – and then shut the line off immediately. We can’t do that, but in many backbone arbitrage schemes, carriers can. We pay the same amount per month but their costs per subscriber are a fraction of that. Now they want to cap us at 250GB, citing the increased costs of serving up video and music. The vast majority of Internet users will never bump up against their artificial ceiling and, for the most part, it would work. However, certain gamers, downloaders, and creative types need that bandwidth and they will pay double just to get another dose. The fixed costs of that bandwidth is going down but ISPs can double or triple up, if need be, forcing folks used to “unlimited” fast Internet to either slow down or pay much, much more. That 250 gigabytes-per-month works out to about one megabit-per-second, which costs $8 in New York. So your American ISP, who has been spending $0.40 per month to buy the bandwidth they’ve been selling to you for $30, wants to cap their maximum backbone cost per-subscriber at $8. This isn’t about capping ISP losses, but are about increasing ISP profits. The caps are a built-in revenue bump that will kick-in 2-3 years from now, circumventing any existing regulatory structure for setting rates. The regulators just haven’t realized it yet. By the time they do it may be too late. They’ll throw all kinds of whitewashing against these concepts but, in the end, the ISPs will probably get their way. We could vote with our feet but where would we go? Indie ISPs went out with the Well and Mondo 2000 and we’re stuck with the big guys running lines into our homes and then paying a premium for their sub-par service. ISPs have always been a joke, but now it’s getting serious.